We would like to reassure you that our Surveys are GMC approved and created in association with Wessex LMCs, as well as being anonymous and peer bench marked in line with GMC guidelines. They are approved for Revalidation. This survey is conducted on paper forms that are handed out to your patients and collected back in for you, typically, by a member of the Reception Team within your Practice. Once you have created a survey in your FourteenFish account, you have access to a personalised .pdf file that you download to your computer and print out. We need 34 responses (the GMC recommended minimum) and once you have them, you can either send them to us by post or scan and upload them to us directly. The cost of this is £28. To create a Patient Survey..
Click on Create new feedback survey in the grey toolbar. Select Patient Survey for an individual, and choose your Patient Feedback type. 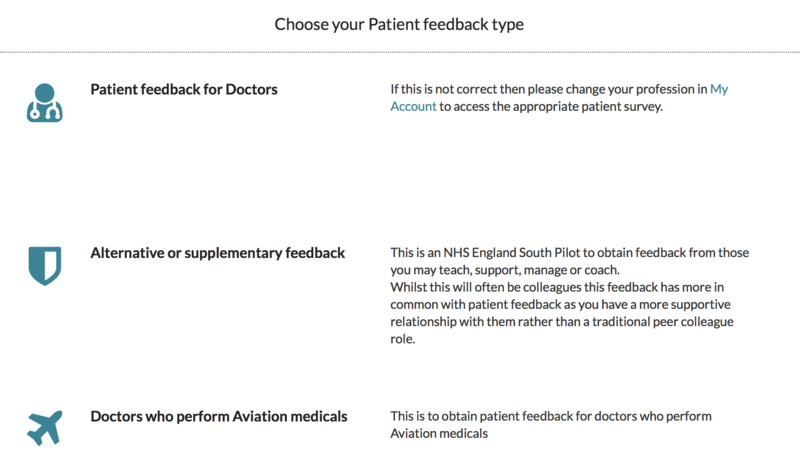 The Patient Feedback options are dictated by the profession you have set on your account, e.g. if you are a nurse, and this is set as the profession within your account, then the option Patient Feedback for Nurses will be available and you can follow the same process through. Next you will be able to complete your Self Assessment. Ask your Receptionists to hand out surveys (with a pen) to patients. The GMC recommends that the survey is given to 45 consecutive patients. Completed surveys can be collected in a box in the waiting room or handed back to your Receptionists. Important: If you are posting your surveys please don't staple, paperclip, fold or put the responses in individual envelopes. We scan the responses before entry and removing staples etc can delay entry. You can make payment at any time during this process but you will need to have paid before the Summary will be released to you. The most straightforward way of doing this is looking out for the pink button at the bottom of the Patient survey setup page (you will only see the Community Credits option if you are a member of a community that provides you with free surveys). You will be notified once the surveys have been received (either by post or upload) and a few days later you will receive an email to say that the report is ready to view and download. You can access this through your account by clicking again on Surveys from the Dashboard and then on View Summary next to the completed survey. Any data is held securely and in accordance with the Data Protection Act 1998. Wessex LMC developed this questionnaire and hold copyright, therefore please don't use it elsewhere without the express permission of Wessex LMC's.